Got Questions? Heres the place to find the most common questions and the answers. ​Can't find the info you need? Email us Now! Current Production times vary week to week depending on our order volume. On average we run about one week but as little as 24 hours on some orders. Current production times are listed on our Home Page, Contact Page, and the Shipping info popup on our Cart. ​Square or Paypal two of the largest online processing companies. What Quilts will fit my hammock? --- I have a _______ Hammock, will the _________ Quilt fit my hammock. Mr. Arrowhead, your hammock camping guide. How do you rate your quilts? We calculate our temp rating by a double check system. First off we do the math on the insulation/fabric combination, there are a couple methods and formulas, but we work for an average. Second, we rely on real-world testing, both from our own use as well as feedback from thousands of customers over the past 9 years. We combine the numbers and create a conservative rating that we feel is a safe comfort rating for most users. Are the KAQ's Reversible? Is there a head or foot end to the quilts? Yes, they are reversible, You can hang with one color out one night and switch it to the other the next. And no there is no set head or foot end, however, once you have the quilt adjusted and set to fit you it can stay adjusted if you hang it the same each time. 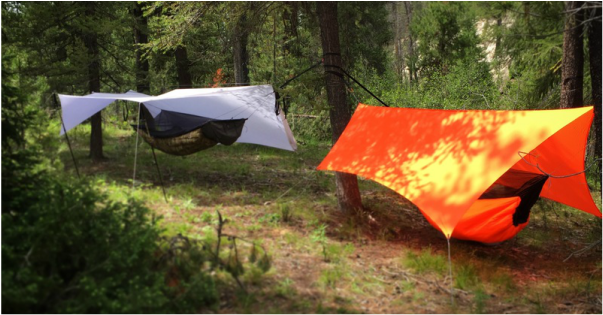 The only exception is the RidgeCreek UnderQuilt And RidgeCreek XL UnderQuilt which do have a set inside and set outside and set head end. Should I pick a Full Length or a Partial Length UnderQuilt. Full Length versus Partial Length Quilt selection comes up frequently, here are my general thoughts on it. Choosing between the two are a couple factors. Partial length quilts came about to reduce pack volume and make use of a pad that can serve double duty as a sit pad around camp or on the trail...make that log a little more comfortable. Some pack manufactures also use a pad as the back support...mostly ultralight packs....so now the pad could serve 3 uses making it more functional for the weight to carry. In the long run it works out as a net weight saving over a full-length quilt. Full-length Underquilts like the New River, however, can function warmer as if you roll over and the pad moves out from under your feet they get cold and you wake up...a full-length quilt does not have that issue. They let you stretch out and you are still insulated. They take up a bit more pack volume, weigh a bit more, but have less fiddle factor to set up and adjust. How strong is your Hammock suspensions? I am XYZ Pounds will your suspension hold me? ​We work hard to produce the best hammock suspensions available anywhere. We have done extensive testing and manufactured more than 8000 hammock suspensions in the past 9 years. We rate all of our suspension components to 450 pounds. However, if you should need a suspension stronger we can provide a custom built Hammock Suspension to any spec you could need. Do you ship orders outside the USA? Yes of course! We ship orders worldwide using USPS Priority international post. We have shipped to over 100 countries around the globe as well as to APO/FPO military mail. Just keep in mind that shipping times on international shipping varies greatly. We use the fastest shipping option to get your package on the way out of the US but some receiving countries do not process shipments at the same speed. Most of the time once we ship your order it will be out of the US within 48 hours, however, allow 4-6 weeks for it to arrive. Check out our How to Videos Page for tips on fitting you quilt, care and cleaning your quilt, adding a Ridge Line to your hammock and more videos all the time. Or Shoot us an email with our Contact Us Form.